Software to create and automate labels, barcodes and more. Designed for businesses that want to increase efficiency by automating their printing, the BarTender� Automation Edition offers the full power of Intelligent TemplatesTM plus the ability to launch printing from other programs. 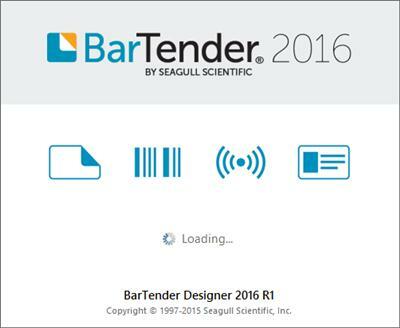 BarTender� Automation leverages conditional printing, our exclusive Intelligent TemplatesTM and printing from other business systems to increase system flexibility and reduce maintenance. Integration Builder and Administration Console together provide powerful control over creating and managing your system integrations. Create highly customizable integrations to seamlessly connect BarTender's printing capabilities with virtually any enterprise business operation. - Leverage conditional printing to create a wide variety of labels from a single design, without the headache of maintaining a separate document for each label. - Easily support complex printing scenarios by telling templates, layers and even individual objects when to print based on a single data source or database field, or based on multiple conditions - all without scripting. - Lock mandatory content so it cannot be changed by other designers. - Print content to specific panels of security cards, including monochrome black, UV fluorescing, and overlay panels. - Let BarTender's smart wizards guide you through critical design decisions to maximize your printing performance and compliance with important standards. - Use your own fonts or those built into the printer. - Generate anything from simple serial numbers to advanced custom serialization sequences. - Format text any way you want with Rich Text formatting. - Enhance imported graphics with high-quality image-processing controls, including brightness, contrast, saturation, hue, sharpness, smoothing and cropping. - Recreate legacy labels easily by importing old designs to use as a guide. - Link to external graphics to enable dynamic changes. - Integrate with other software for basic automated control. - Manage user permissions and encrypt documents. - View printer status and reprint previous jobs. - Minimize print-time data entry by letting BarTender pull data from Excel files, text files and a wide variety of databases. Or design your own forms for entering data easily at print time. - Easily select, preview and print labels and cards from a dedicated Print Station interface. - Print multiple label formats as a single batch, whether from BarTender, the dedicated BarTender Print Station or even the Windows Explorer. - Print to any true Windows printer driver, and use our free Drivers by Seagull to leverage the special features of label and card printers for optimal performance. BarTender Enterprise Automation 2016 11.0.6.3141 download links are provided by Extabit Rapidshare Uploaded Rapidgator Netload Bitshare Freakshare Letitbit Dizzcloud and more.